Madrid may be Spain’s capital, but it is Seville that has truly captured my heart. Andalucia’s biggest and most exciting city, Seville has been seducing visitors for centuries; one of the first people recorded as falling in love was the 11th century Muslim poet-king Al-Mutamid. The place is working its enchantment every bit as well today – stylish, ancient, proud, yet also fun-loving and intimate, Seville has given rise to some of the world’s greatest musicians, and is one of the homes of Flamenco. But don’t expect to encounter great long vistas and awe-inspiring monuments to modernity in Seville. Except along the Guadalquivir – navigable to the Atlantic Ocean 100km away, and the source of Seville’s greatness in times past – the city’s crowded centre unfolds more subtly as you wend your way through narrow streets and small squares, stopping for an obligatory round of drinks and tapas in some of the wonderful bars and cafes. Indeed bars usually stay open late at weekends – often past 4am – so be prepared to adjust to the Andalucian timetable, and expect most clubs to be graveyards before 1am. That being said, even non-stop party animals need somewhere to rest their head, and in this regard Seville does not disappoint. 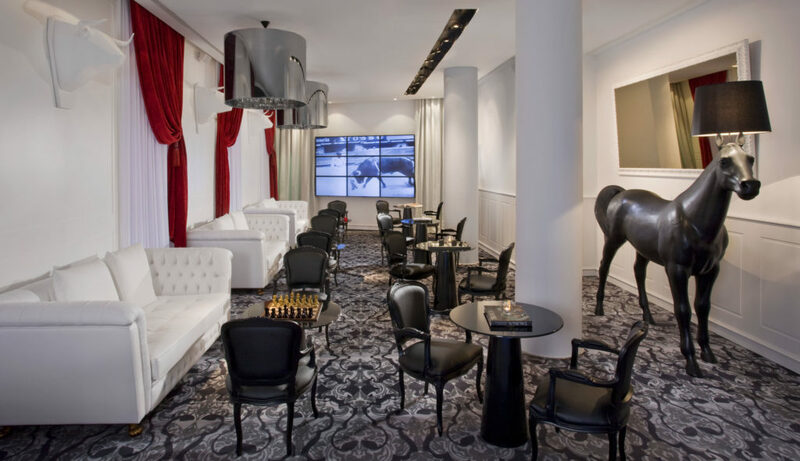 The city boasts some of Spain’s finest hotels, including the Mercer, which was our first port of call. The hotel is situated in a not particularly glamorous part of Seville, right at the heart of the city’s Arenal district. But, such a position means that all of Seville’s major sights, including the cathedral and shopping area, are never more than 10/15 walk minutes away. However, the building itself is utterly exquisite; a temple to contemporary design in a restored 19th-century palace, the hotel’s style marries a traditional Andalucia casa palacio from the late 19th century with contemporary furnishings and fittings. So a minimalist chandelier, which hangs above the patio, complements the wrought-iron balconies, marble staircase and arches and fountain. It’s enough to make any discerning sybarite swoon, and we haven’t even discussed the rooms, or bar yet. Arriving early, our rooms were not yet ready as it happens, so after the hotel’s gracious staff offered us a glass of Cava, we settled into the hotel’s stylish bar for a pre-lunch libation. As you’d expect, we spent far too much time at the Fizz Bar, which attracts a well-heeled international clientele looking for superlative cocktails, service and tapas in suitably chic surroundings. Unlike the often frenetic atmosphere of Seville’s nighttime haunts, Fizz Bar is all about serene enjoyment of your mixologists bespoke creations – a sophisticated experience, bar none. And so to our room, which surpassed all expectations. 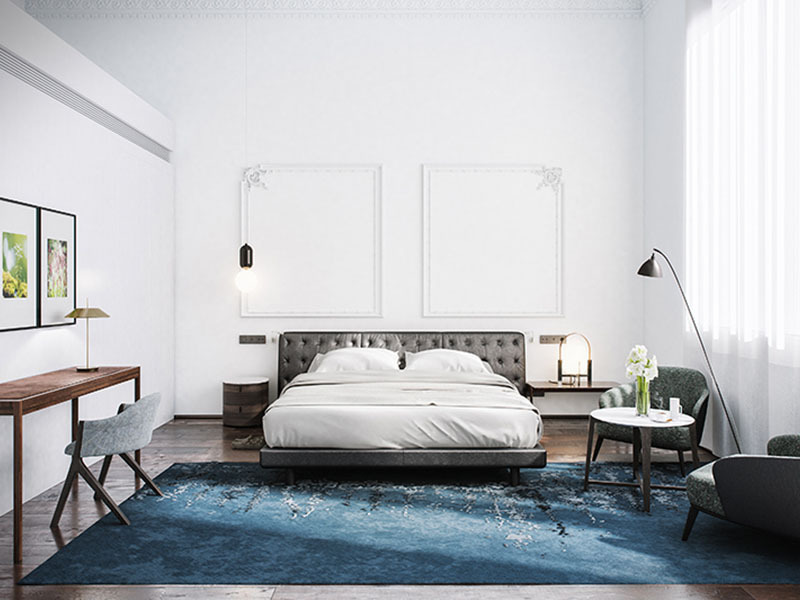 The Mercer is boutique in every sense of the word – only 12 rooms await guest, divided over two floors and offered in five price categories; spacious first-floor ones have lofty four-metre ceilings, while smaller second-floor rooms at the front boast desirable shaded private terraces (201 and 202). 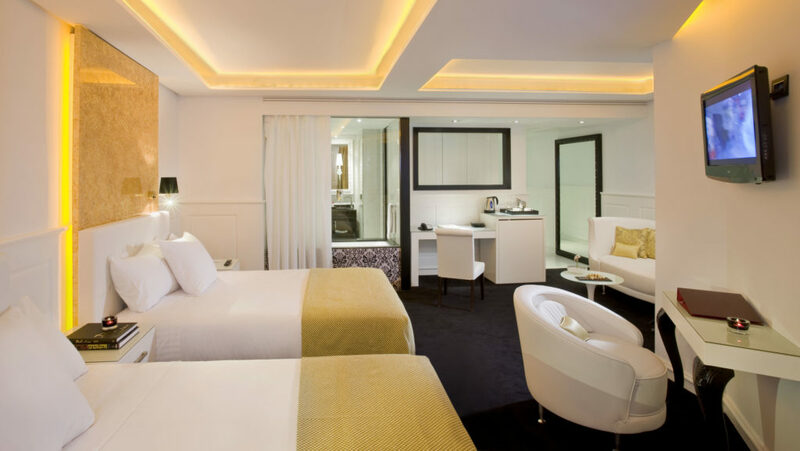 Our room was furnished to an extremely high standard indeed – large beds, luxury fabrics and a gargantuan, contemporary bathroom, not to mention the essential free wi-fi throughout the hotel and Nespresso coffee machine. Unpacking frantically (there’s never time to waste on banal trivialities in Seville), I suggested returning to the hotel’s terrace as this wasn’t my first visit to the city – sometimes hedonism trumps exploration. My companion, however, insisted we explore Seville before lapsing into typical eat/drink and be merry tourism. So the Santa Cruz district was the obvious first port of call, Seville’s most famous (and tourist-ridden) district which was the city’s Jewish quarter and today houses most of Seville’s historic attractions. Most visitors fall in love with its tangle of quaint, winding streets and lovely squares with flowers and orange trees, although you’ll have to share it with the tourist rabble that got their first. 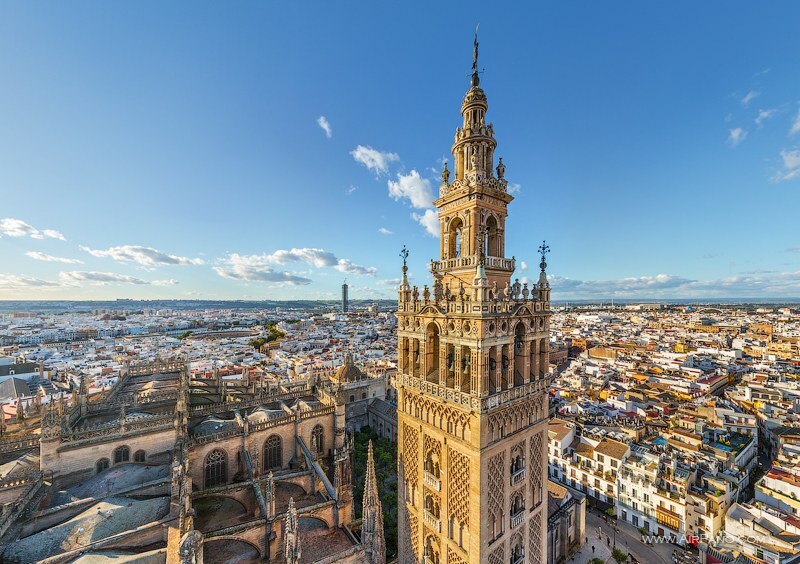 Nevertheless, the district’s star attraction – Seville’s magnificent Cathedral & Giralda – cannot be omitted from any visitor itinerary to Andalucia. It stands on the site of the main Almohad mosque, with the mosque’s minaret, La Giralda, still towering beside it. After Seville fell to the Christians in 1248 the mosque was used as a church until 1401. Then, in light of the building’s dilapidated state, the authorities decided to knock it down and start again. Today the main building cuts a fine figure, and is one of the largest cathedrals in the world (126m long and 83m wide). It was finally completed by 1507 – all in gothic style, though work done after its central dome collapsed in 1511 was mostly in Renaissance style. The upshot is that this fascinating slice of history demands at least an afternoon of your time. It houses Columbus’ Tomb, among other things, and the interior is utterly exquisite, particularly the beautifully domed cabildo (chapter houses). By now I had satisfied my cultural fill, but my companion insisted we also pay the Alcazar a visit. Located south of the Cathedral across Plaza del Triunfo, the Alcazar is more palace than castle. It was founded as a fort for the Cordoban governors of Seville in 913, although it has undergone many expansions and reconstructions since then. Above all, it’s a beautiful palace that should not missed, not least for its associations with the lives of several rulers, above all the extraordinary Pedro I, who was known as either El Cruel or as El Justiciero (the Justice-Dispencer) depending which side you were on. But enough culture. We jumped into a taxi and crossed the Guadalquivir into Triana – my favourite part of Seville. This barrio (district) used to be Seville’s gitano (Roma people) quarter and was one of the birthplaces of Flamenco. The gitanos were moved out to new suburban areas in the 1960s and 70s and Triana is now rather trendified, and relatively free of visitors. There’s no major sights, but the atmosphere at night is unbeatable and offers a more real perspective on how Sevillanos kick back and party than Santa Cruz. We stayed in Triana until the early hours, drifting from bar to bar in that obligatory Spanish fashion. The highlight was Bar La Fabula (Ronda de Triana 31), a quintessential Seville tapas bar that serves delicious bite-size morsels at wallet-friendly prices. And, not a tourist in sight. Our brief soujourn to Seville was already drawing to an end, but we decided to abandon our planned day of tapas bar crawling and headed instead to Jerez de la Frontera. The city of Jerez, spread over a low rise in the rolling countryside 36km northeast of Cadiz, is easily accessible by train from Seville, and boasts Spain’s greatest contribution to the wine world – sherry. Made from grapes grown on chalky soil surrounding the town, British money was largely responsible for the development of wineries from the 1830s. Today it’s a gorgeous town, particularly the old quarter which is a smorgasbord of fancy shops, pretty squares and beautiful churches. We spent two hours strolling around, stopping for the essential round of tapas, before we even reached our destination. Which, naturally, was a sherry bodega (cellar). Gonzalez Byass is a name familiar to all sherry aficionados; it was founded in 1835 when the pioneering 23 year old Manuel Maria Gonzalez left his banking career to pursue winemaking in the heart of fortified wine. Linking up with an English family – hence the Byass surname – the bodega’s legacy is formidable, yet Gonzalez Byass is no stranger to modernity. Their historic winery also houses a modern visitor centre and restaurant, which judging by our visit is in high demand from tourists from across the world. Tours are multilingual and offer a fascinating insight into sherry production – https://www.gonzalezbyass.com/en/. We could have stayed in Jerez all day, but our next destination called and Seville on a Friday night is just too much to resist. 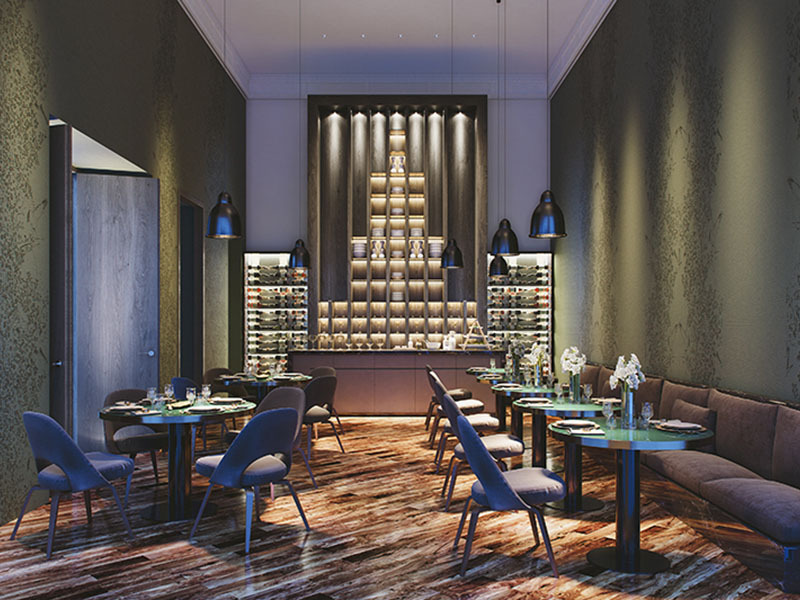 The Gran Melia Colón, our final address, is the Mercer’s nearest competitor – a glamorous 5-star hotel that nevertheless offers a very different experience from the Mercer in every sense of the word. The situation is designed to make shopaholics swoon – just steps away from the main shopping area, the hotel is also close to many excellent restaurants, as well as the superb Bellas Artes (Fine Arts) Museum, and is about 15 minutes’ walk from the cathedral. Moreover Triana is merely five minutes away, an obvious plus point from my point of view. After a painless check-in, we settled into our room and took the time to explore the Gran Melia Colón further. 189 rooms cater to your needs; suitably high quality furnishing and fabrics are de-rigueur in this class of hotel, but the black-and-white neo-Baroque patterned bathroom really impressed. Every room has a bathtub plus Clarins amenities, including mini Eau Dynamisante; some have separate showers. My advice is to bag a room on the sixth or seventh floor – they boast superb views of the cathedral. Incidentally, the hotel welcomes celebrity bullfighters before a ‘corrida’ – as such, a bullfighting theme is evident throughout, including (replica) bulls’ heads on the walls. Yet in other ways the Colón is not a traditional Andalucian hotel – the colour palette throughout is dramatic rather than staid: white, black, red and gold: red flower chairs, white chaise longues, black fringed pillars and shiny gold pendant lamps. It lends the hotel a very contemporary feel, a nice change after the Mercer. Pieces by designers like Philippe Starck and Edra are the icing on the cake. The list of facilities is also impressive – again something of a rarity in Seville. For those tired of sightseeing – by now we fell into that category – the triangular-shaped rooftop pool (heated in winter, unusually) is standout, with glass walls to maximise the panoramic views, including the cathedral and Giralda. The Clarins spa is another vital pitstop for weary travellers, as is El Tendido, the hotel’s chic cocktail bar. It’s the perfect antidote to the madness of Seville on a Friday night – innovative cocktails, soothing soundtrack and slick service set the scene for a very relaxed evening. But first things first – dinner. The hotel’s El Burladero tapas bar, with pavement tables, is something of a chameleon – there’s the more formal restaurant and casual dining with a line of tables flanking the bar. We fancied something more causal and so enjoyed a surfeit of exquisite tapas and larger plates, in the most convivial of surroundings. Service was also first rate, as was the extensive wine list which included some options from outside of Spain – unheard off in Seville. We imbibed far too much sherry before retiring to bed as our flight the following morning left at an ungodly hour. There’s no problem however: I’ve already planned a return visit in the autumn (avoid Seville in July and August, the heat is unbearable), which will be my 7th visit to this glorious city. “Don’t you want to explore further afield and see something new,” my companion enquired, as we boarded our flight. Yet this is precisely the beauty of Seville – its charms enrapture you even if you’ve exhausted all the sightseeing options, of which there are many. Simply put, Seville is an atmosphere. Being out among its celebratory, happy crowds on a warm evening is an unforgettable experience, bar none. This is Seville’s greatest treasure – not the cathedral or Alcazar – but simply its citizens unrivaled joie de vivre. Historic sights are all well and good, but it’s the lively tapas bars, brilliant nightlife and passionate devotion to hedonism that keeps tourists coming back for more. I flew with British Airways to Madrid – BA offers daily flights to Madrid from London Heathrow. For more information, see – www.britishairways.com. Regular trains run from Madrid’s Atocha station to Seville Santa Justa.